In this mode, breakpoints have no effect at all, but you can leave them in your sketch, if you want to. In this mode, the breakpoint updates expression windows, trace and code windows but execution of your sketch continues without interruption. In this mode, when a breakpoint is hit, it halts execution of your sketch until you press [F9]. 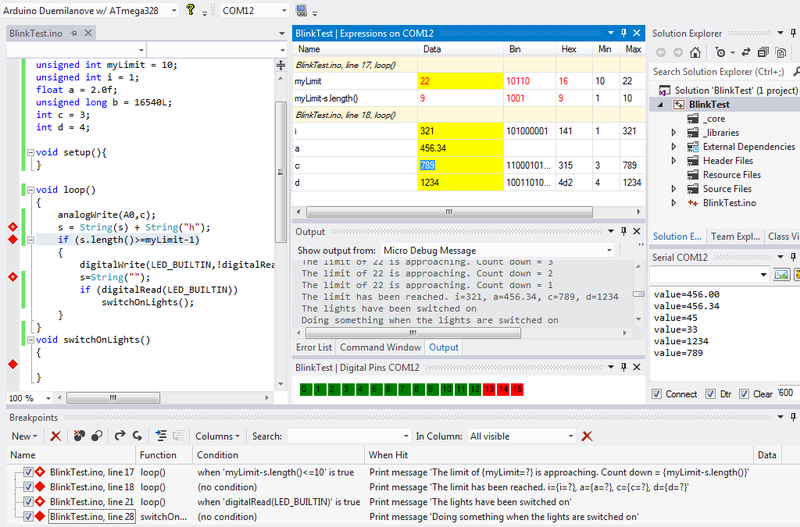 Disabled debugging in the Project Properties window by setting "(Micro Debug)" to "None"
Enable breakpoints in the Project Properties window by setting "(Micro Debug)" to "Full"
If you added a "When Hit" condition to a breakpoint, check "Continue execution", see "Working With Breakpoints/When Hit"
If you chose Break/Pause = True and your sketch is halted in a breakpoint, see the link below in the "See also" section to find out how to stop the sketch at that point, recompile and upload. In this mode we can alter any of the assigned writable variables at any time however the change in value will only be recognised when the BreaPoint/TracePoint is hit/passed. The order that variables are updated corresponds to the order that you update them. For example if you update var1 which is in a breakpoint hit every 10 minutes then no other updates will be applied to any other variables until the 10 minutes has been reached. If you are updating variables in a fast loop() then, subject to your code, the updates should also be applied immediately. In this mode only the variables of the current breakpoint can be changed. 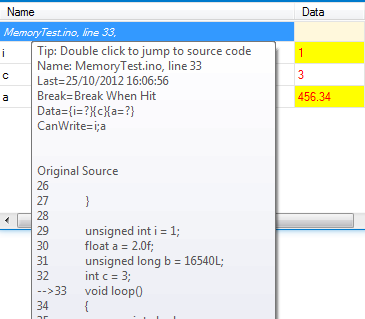 In the image below the breakpoint configuration specifies variables 'i' and 'a' to be read/write and 'c' is read-only. This configuration is specified using the "WhenHit" property of the breakpoint.